Final Fantasy XIV: A Realm Reborn is a lovely game, but few would call it "innovative." I've been playing the game on both PS4 and PC for the past several weeks and have been having a blast. But even a relative MMO lightweight like me can tell that the game isn't breaking much new ground. The gameplay feels more or less like other MMOs I've played and the visuals, while lovely, still have the too-clean look of a mid-2000s PC RPG. It lets me play with a controller. 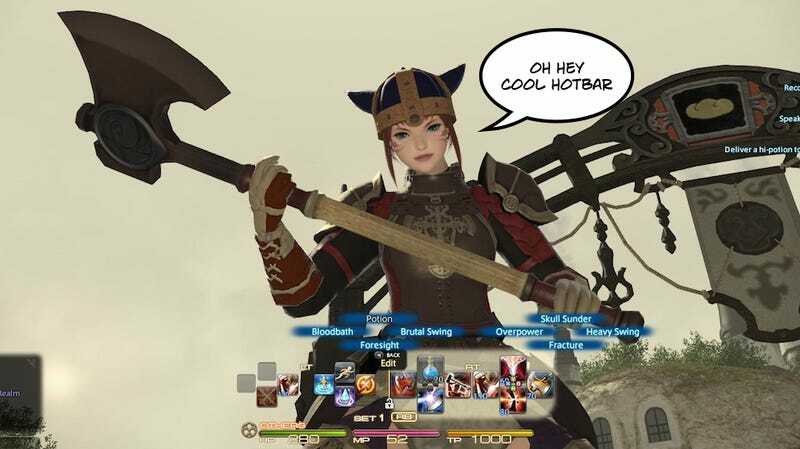 When I first fired up FFXIV on the PS4, I had my doubts about how it would all work. Could an MMO, with all its various menus, combat styles, dialogue boxes, chat windows, hotbars, and other MMO accouterments, really work on a controller? And for the first hour or so, I'd have answered that with a firm "No." I understand that the controller approach won't be for everyone. I'm a pretty casual MMO player and I don't do high-level raids or PvP stuff; I wouldn't want my character's controller-induced clumsiness to hurt the progress of a team of players. And I realize that it isn't the first MMO to support controllers, and that it is technically possible to play other MMOs with a controller by using X-padder to map controls to a gamepad manually. But most games don't feel as consciously designed for a controller as FFXIV is, and while there are plenty of controller-related things FFXIV could make work more smoothly, hopefully it's only a matter of time before another MMO-type game takes their groundwork and improves on it. The upshot, for now, is that I'm generally a lot more likely to play FFXIV than I would've been had it been only playable on my desktop PC. I sit on the couch and play an MMO with a controller. And it is wonderful.